Inspired by this year’s National Minority Health Month theme, Partnering for Health Equity, the NCI Center to Reduce Cancer Health Disparities (CRCHD) is celebrating its Partnerships to Advance Cancer Health Equity (PACHE) trainees in a new series of blog posts. We asked PACHE trainees and early-stage investigators to tell us about their work, partnerships, and mentors. 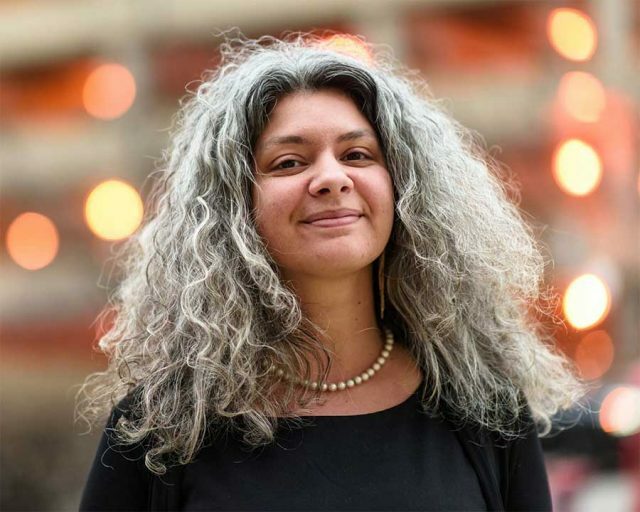 Former ChicagoCHEC Research and Education Core Co-Leader from UIC and the University of Illinois Cancer Center, Dr. Yamilé Molina is featured in this PACHE Spotlight Blog Post. Click here to read more. The American Lung Association has launched a new report, LUNG FORCE “State of Lung Cancer.” The LUNG FORCE “State of Lung Cancer” uses state-specific data and compares lung cancer incidence, survival, stage at diagnosis, surgical treatment and American College of Radiology accredited screening centers among states across the country. Through this report we will be able to identify trends and areas where states have the greatest need for added awareness and resources. The report identifies potential interventions and provides a state-specific understanding of the burden of and opportunities to address lung cancer. The report includes state-specific measures of lung cancer incidence, five-year survival, stage at diagnosis, five-year survival by stage at diagnosis, surgery as part of the first course of treatment, and accredited lung cancer screening centers. States were ranked for each measure. Information is also shown for state-specific radon zones, smoking prevalence and particle pollution. Attached is a one-page infographic on Illinois and additional details for our state can be found here. with our community partners and we would love to hear your voice. 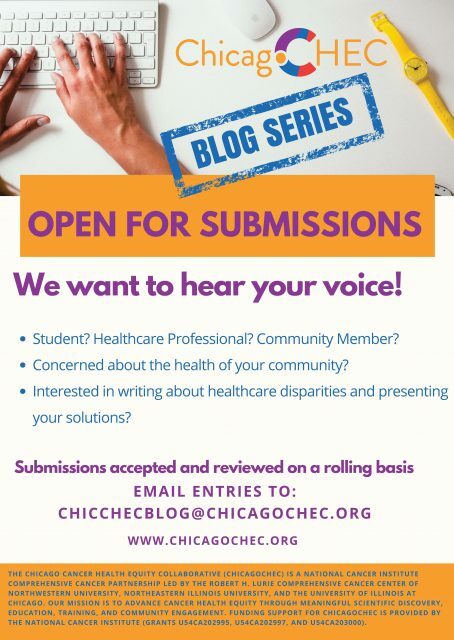 Blog submissions will be reviewed on a rolling basis and posted on the ChicagoCHEC website. Please email [email protected] with additional questions. Check out Skinny Trees for a brand new (mini) episode led by Anika Jagasia, a rising high school Senior! In late 2017, we will release the call for applications for Cohort 3 of the ChicagoCHEC Research Fellows Program! Please feel free to hang the attached flyer in relevant areas of your organization/institution! For any questions, please contact [email protected]! ChicagoCHEC está financiado por el Instituto Nacional de Cáncer (propuestas U54CA202995, U54CA202997, y U54CA203000). El contenido es responsabilidad exclusiva de los autores y no representa necesariamente las opiniones oficiales de los Institutos Nacionales de la Salud. 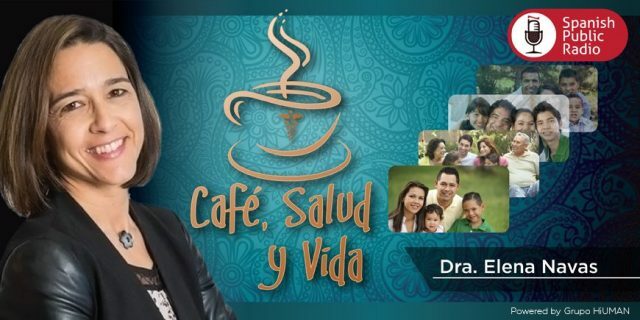 Sandra San Miguel from the National Cancer Institute, Melinda Monge, Community Health Educator from ChicagoCHEC and Colon Cancer Survivor Cristina Mendiola join “Health over Coffee Time/Cafe, salud y vida” with Dr. Elena Navas to discuss colorectal cancer awareness month. The interview is in both English and Spanish. The interview will air this coming Friday 3/24 at 10 am and 5 pm (CST)! CHICAGO — Dr. Melissa Simon, the George H. Gardner Professor of Clinical Gynecology at Northwestern University Feinberg School of Medicine, has been appointed to a national task force that makes recommendations on clinical preventive services, including screenings, counseling, and preventive medications on topics such as cancer and diabetes. The appointment is “an amazing, pie-in-the sky career goal,” said Simon, who also is the vice chair for clinical research in the department of obstetrics and gynecology and a professor in the departments of preventive medicine and medical social sciences at Feinberg. She began her four-year term with two other new members on Jan. 1. “It’s quite a huge honor to be able to represent primary care providers, especially in the area of women’s health – and specifically in the area of obstetrics and gynecology – while at the same time championing recommendations that meet the needs of diverse populations at a national level,” Simon said. Simon also is director of the Chicago Cancer Health Equity Collaborative, a National Cancer Institute-funded initiative to reduce cancer disparities in Chicago’s low-income neighborhoods. To learn more about Dr. Simon and all members of the Task Force, visit the USPSTF’s members page. Click here for our Community Benefits Report, highlighting the first year of our partnership. 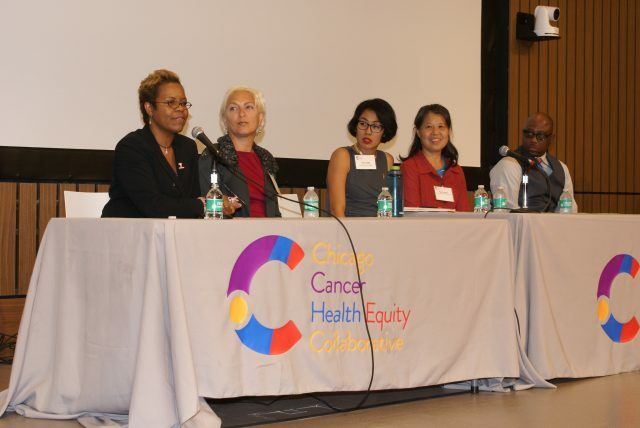 CHICAGO – Six separate research projects into cancer health in Chicago’s underserved communities have been funded in the past year, the Chicago Cancer Health Equity Collaborative (ChicagoCHEC) announced at its first annual community report and symposium on Thursday, Sept. 29, at Chicago’s Malcolm X College. 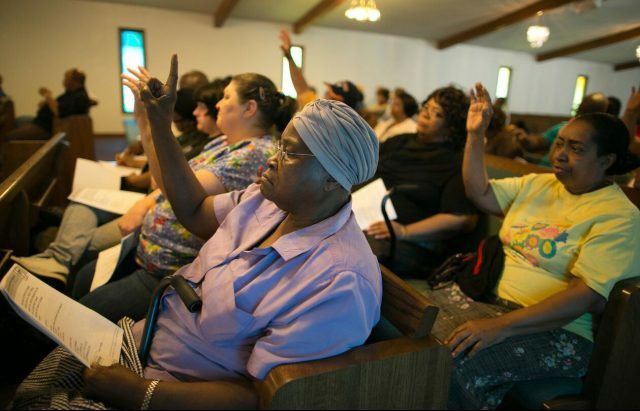 The studies address disparities ranging from breast cancer among Hispanic women to prostate cancer in the African-American community. 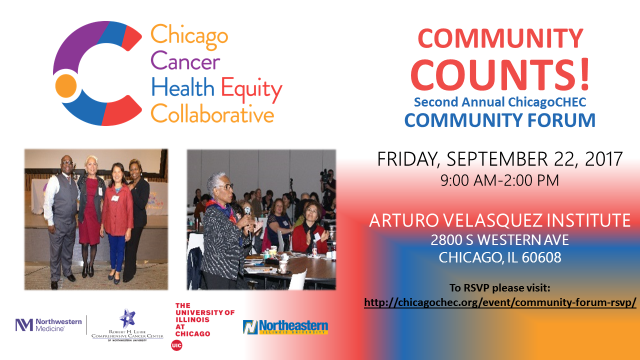 Led by researchers from the Robert H. Lurie Comprehensive Cancer Center of Northwestern University, Northeastern Illinois University and the University of Illinois at Chicago, ChicagoCHEC is a groundbreaking collaborative that fosters meaningful cancer research, education, training and outreach within the city’s underserved communities. Through activities such as the symposium, ChicagoCHEC is setting a new standard among funded projects by keeping the community informed on its progress and soliciting feedback about how to most effectively approach cancer disparity research differently. It is supported by a five-year, $17.4 million grant from the National Cancer Institute. According to data from the Illinois Department of Public Health, low-income Chicago communities that are predominantly African-American or Latino face cancer death rates up to double the national average. “Our goal is to transform how community engagement and research are conducted, thus changing the architecture of how we collectively improve health equity,” said Dr. Melissa A. Simon, the George H. Gardner, MD, Professor of Clinical Gynecology in obstetrics and gynecology at Northwestern University Feinberg School of Medicine, and co-director of the Lurie Cancer Center’s Cancer Control and Survivorship Research Program. “In addition to community and institutional partnerships, supporting collaborative research to improve cancer prevention, early detection, treatment and survivorship is an essential element of this partnership,” said Christina Ciecierski, associate professor of economics at Northeastern Illinois University. 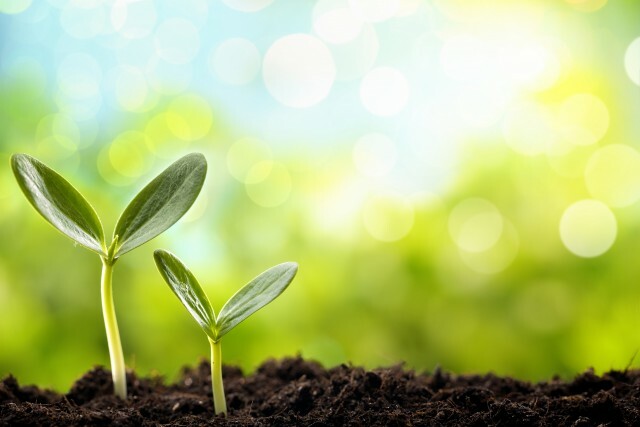 Of the six research projects funded in the past year, the three projects originally funded with the grant in October 2015 have made significant progress. The Choose to Change project tests a new approach to reducing cigarette smoking among patients of Near North Health Services Corporation, a large safety net community health center in Chicago. Researchers on the project are closing first-round tests of a new one-step electronic referral and feedback system that connects more smokers from federally qualified health centers to free smoking cessation treatment at the Illinois Tobacco Quitline. The WeCanConnect pilot aims to develop and evaluate a mobile app to promote peer support and information sharing among people with pre-existing disabilities who have been diagnosed with cancer by matching them to cancer survivor peers in the disability community. Experts in cancer care for people with disabilities (many of whom are cancer survivors with disabilities themselves) and members of the disability community are currently providing critical insights into their needs and priorities. As part of the project, UI Health’s Mile Square Health Center and the Program for Healthcare Justice for People with Disabilities will host ScreenABLE Saturday: A Celebration of Wellness for Women with Disabilities on Oct. 15. The centerpiece of ScreenABLE Saturday will be free accessible cancer screening for women with disabilities who are 22 percent less likely to get screening mammograms than their non-disabled peers. The Mi Guía (My Guide) study aims to create and evaluate a smartphone app for English or Spanish-speaking Hispanic women completing treatment for breast cancer, which is the leading cause of cancer-related death for Hispanic women. Through the Mi Guía app, Hispanic breast cancer survivors will receive culturally relevant information to help them improve cancer-related symptoms and health-related quality of life. A group of breast cancer survivors has provided initial feedback to help refine content and design of the app. Three newer research projects, funded in May of this year, are still in the organizational stages. These projects address prostate cancer disparities among African-American men, obesity intervention development for Puerto Rican and Mexican men, and colorectal cancer disparities on Chicago’s South Side. The Community Steering Committee of ChicagoCHEC is at the heart of the coalition’s efforts, according to Dr. Moira Stuart, associate professor of health, physical education, recreation and athletics at Northeastern. “The 20-plus key community stakeholders on the committee represent the diversity of Chicago communities related to race/ethnicity, gender, sexual orientation and disability,” Stuart said. “Our community steering committee is central to guiding the strategic efforts to foster meaningful partnerships across Chicago communities.” Click here for a Spanish article from La Raza highlighting the work of ChicagoCHEC Steering Committee Member Esther Sciammarella from the Chicago Hispanic Health Coalition. The symposium featured a panel of public health care providers, a town hall forum and networking opportunities to mobilize Chicago communities in the areas of cancer survivorship, health care access and delivery, research and clinical trials, community capacity building and cancer health education. During the town hall, community members expressed the desire to ensure they continue to be part of the conversation about improving health outcomes, to address language barriers in medical treatment and to engage with academic research activities. Click here for an interview of community members and breast cancer survivors Maria Constance Medina and Maria Mercedes Reyes from Spanish Public Radio by Dr. Elena Navas. Dr. Linda Rae Murray, the former chief medical officer of Cook County Health and Hospital System, and breast cancer survivor Roz Varon, the Emmy Award-winning traffic and transportation anchor for ABC 7, delivered keynote speeches. Click here for video of Roz Varon at the Symposium from ABC 7. The symposium served to kick off a series of local community events taking place in Chicago through 2016 and 2017. 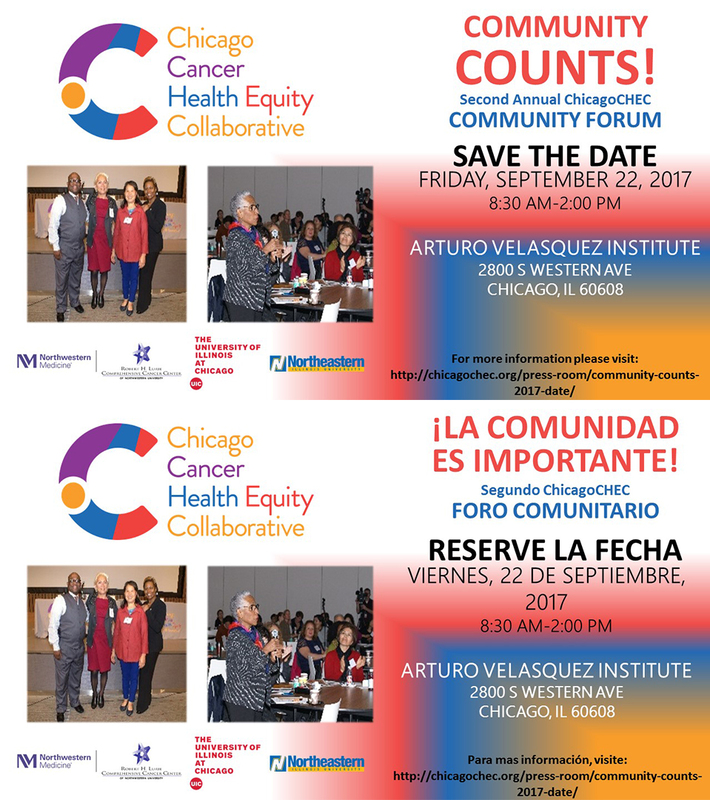 CHICAGO — The Chicago Cancer Health Equity Collaborative (ChicagoCHEC), a National Cancer Institute-funded initiative to reduce cancer disparity in Chicago’s low-income neighborhoods, will host its First Annual Community Report and Symposium from 8 a.m. to 3 p.m. on Thursday, Sept. 29, at Chicago’s Malcolm X College, 1900 W. Jackson Blvd. The free, all-day symposium will be open to the public and provide a detailed look at the ongoing work of the ChicagoCHEC partnership, led by researchers from the Robert H. Lurie Comprehensive Cancer Center of Northwestern University, the University of Illinois at Chicago and Northeastern Illinois University. 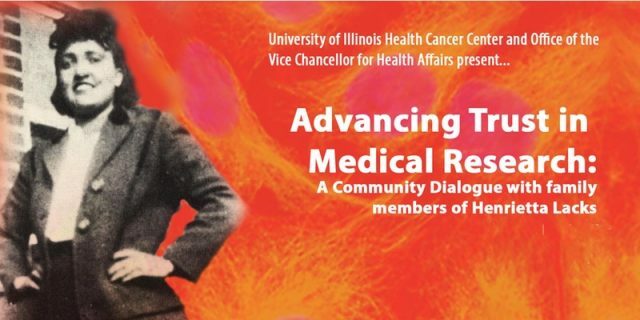 The symposium will feature a panel of public health care providers, a town hall forum and networking opportunities to mobilize Chicago communities in the areas of cancer survivorship, health care access and delivery, research and clinical trials, community capacity building and cancer health education. A diverse panel of cancer survivors will discuss their journeys, including how they have accessed services and how community organizations have supported them. Dr. Linda Rae Murray, the former chief medical officer from Cook County Health and Hospital System, and breast cancer survivor Roz Varon, the Emmy Award-winning traffic/transportation anchor for ABC 7, will deliver keynote speeches at the event. Cook County Commissioner, 7th District, Jesus Garcia will deliver the final keynote address to close the event. The Symposium will kick off a series of local community events taking place in Chicago through 2016 and 2017. More information about ChicagoCHEC, the symposium and event registration can be found on www.chicagochec.org. 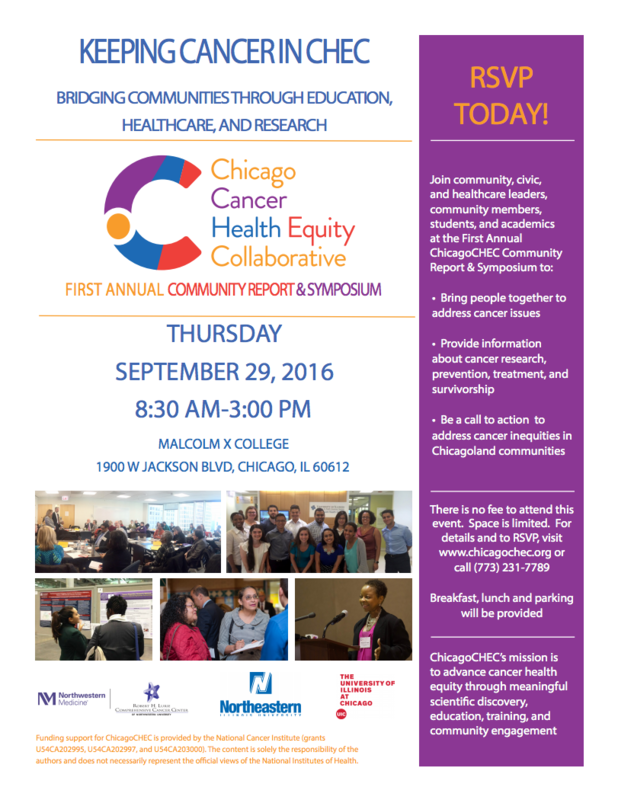 Join us on Thursday, September 29, from 8:30 AM-3:00 PM at Malcolm X College (1900 W Jackson Blvd, Chicago, IL 60612) for Keeping Cancer In CHEC: Bridging Communities Through Education, Healthcare, And Research, ChicagoCHEC’s First Annual Community Report & Symposium. Cancer researchers, medical providers, students, community-based organizations, and community members will come together to report ChicagoCHEC’s accomplishments in addressing cancer issues and lead the call to action to address cancer inequities in Chicagoland communities. There is no fee to attend this event and space is limited. Tour a Pancreatic Cancer Research Lab!!! We all hear about the research that’s being done on pancreatic cancer, but not many of us get the opportunity to actually SEE it. On Sunday, September 18, Dr. Paul Grippo is inviting the Chicago area to tour his pancreatic cancer research laboratory at UIC (840 S. Wood Street, Chicago). No tickets or RSVP needed; just come by any time between 1:00 and 4:00 and meet the man behind the microscope! The tour is free and open to the public. Meet and greet researchers and your Chicago Affiliate Core Role Volunteers. Come join this great experience!! 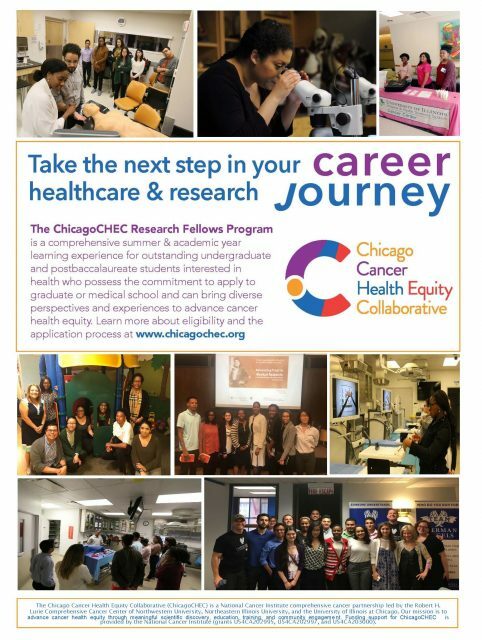 CHICAGO — The Chicago Cancer Health Equity Collaborative (ChicagoCHEC) has kicked off the inaugural Summer Research Fellows program. The ChicagoCHEC Research Fellows program is a comprehensive, paid eight-week summer learning experience for undergraduate and post baccalaureate students from Northeastern Illinois University, Northwestern University, University of Illinois at Chicago and the City Colleges of Chicago. The program is focused on the development of academic, technical and professional skills in preparation for careers in social, behavioral and biomedical research and in health care. 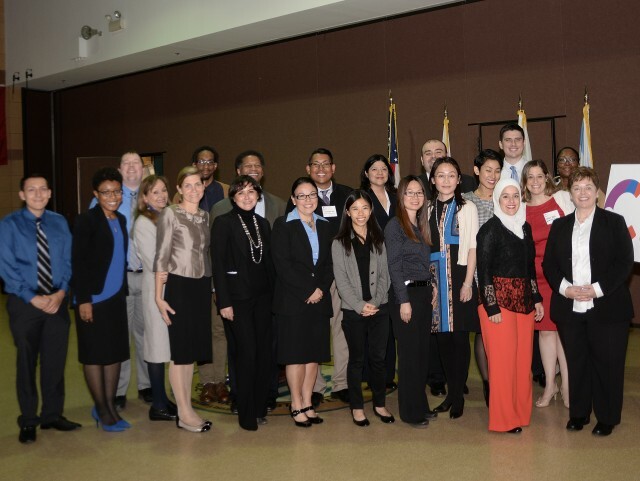 Through immersion experiences, group projects, journal clubs and mentoring, ChicagoCHEC research fellows will gain important knowledge, skills and networks for their journey to become researchers and health care professionals who can bring diverse perspectives and experiences to advance the nation’s work toward cancer health equity. The program leverages the expertise of leading scholars and cancer researchers, health professionals, institutional leadership and community leaders across Chicago taking part as guest lecturers, project mentors and site visit hosts. The program is an opportunity to move the needle on health by expanding opportunities to the next generation in a way that also changes the architecture of collaboration, community engagement and the culture of research education to address health inequities. The principal investigators include Dr. Melissa Simon of Northwestern University, Dr. Robert Winn of University of Illinois at Chicago, and Christina Ciecierski and Moira Stuart of Northeastern Illinois University. 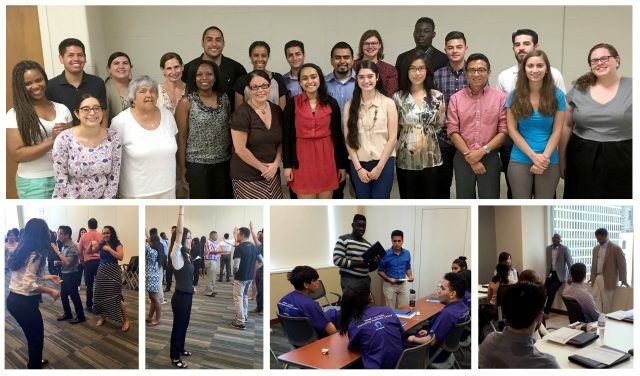 The summer research fellows program is not the only initiative from ChicagoCHEC geared toward students. Simon is vice chair of clinical research in obstetrics and gynecology, the George H. Gardner Professor of Clinical Gynecology and an associate professor of obstetrics and gynecology and of preventive medicine and of medical social sciences at Northwestern University Feinberg School of Medicine. CHICAGO — A new $17.4 million grant from the National Cancer Institute (NCI) will help three Chicago universities work together with many of the city’s underserved communities to foster meaningful cancer research, education, training and outreach.